If you’re looking for an idea on how you can help those in need with your sewing and quilting talents, why not sew to serve by making quilts to help comfort disaster survivors? 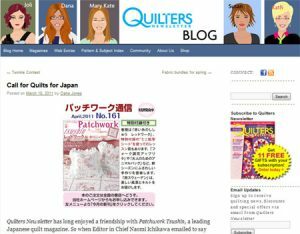 For example, Quilts for Japan, a recent project from Quilters Newsletter Blog dedicated to helping the survivors of the disasterous Tōhoku earthquake with comforting quilts. You can read a bit about this past event from Quilters Newsletter. Check out Quilts for Quake Survivors to see how you can help. Host an event to create a quilt to donate, or send materials and supplies to help this organization raise money for the Mercy Corps Japan Relief Fund. You can also donate directly to the American Red Cross’s relief efforts to help, either through taking up a collection from your quilting group or friends, or by hosting an event with proceeds offered as a donation. These are just a few ways you can sew to serve earthquake survivors in Japan. If you have more ideas or know of other great organizations helping out, let us know by posting a comment.